2011 has been a banner year for Alice Azure. She published her second book of poetry, Games of Transformation; and a memoir, Along Came a Spider. The memoir appears thanks to Joseph and Jesse Bruchac's Bowman Books imprint, which I've blogged about before. Azure has had a complicated life, full of difficulty and success: at age 11 she was sent to the Cromwell Children's Home in Connecticut after her father was sent to prison, and stayed there through high school. She went to North Park College in Chicago, where she met her first husband and raised three children. When she enrolled in the University of Iowa's School of Urban and Regional Planning for a master's degree, she met John R. Salter, Jr., a Mi'kmaq/Mohawk/Abenaki faculty member who changed her life. 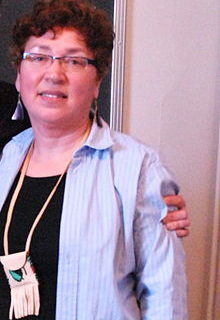 Salter encouraged Azure to work with the Inter-Tribal League of American Indians and to investigate her own Native ancestry. Most of the book is devoted to a compelling narrative of Azure's genealogical research, her trips to Nova Scotia to seek out relatives, and her growing awareness of her Native identity. In this, it also charts a story not uncommon among Native people in the United States: one of being uprooted from family and home, and of reconnecting with land and kin, often in many locations. Azure travels to the northeast every summer to visit family, but she maintains a home in the midwest, and has developed an extensive network of close friends and affiliations with place throughout Indian Country. Suffer the children to come unto me. Years ago, churches built big children's homes. It was the practice of the times--I try to see. I remain partial to Azure's first book, In Mi'kmaq Country, published by the same press--Albatross in Chicago. Small independent presses are so important in keeping great poetry like this alive. Alice has started her own blog; stop by and tell her you're interested in a copy of Games of Transformation, which I can't seem to find available online. Thank you for the reviews of my two books. Games of Transformation is available at http://www.nativeauthors.com and at http://www.amazon.com. I’m glad you like that first book of mine. Soon I hope a full book of poetry will be forthcoming! Now, I’m hard at work on an interview of Charlene Eastman from Rosebud.